Spring Update on the farm - Noland Farms Inc.Noland Farms Inc.
We’re excited to share that Lauren Bafford is the recipient of the 2018 Noland Family Agricultural Scholarship! The future is definitely bright with talented students pursuing education and careers in Agriculture. 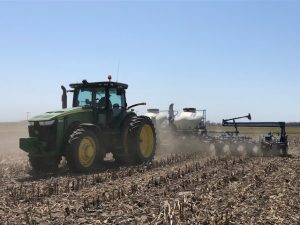 Corn planting was completed on May 1st, soybeans completed on May 2nd and pre-emerge chemical application on May 7th! 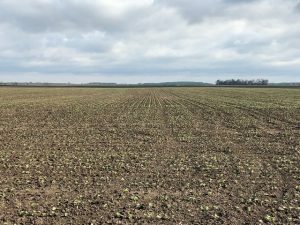 The majority of the both crops have emerged, and we’re excited to transition into the next phase of field operations. Post chemical and sidedress nitrogen application is right around the corner! 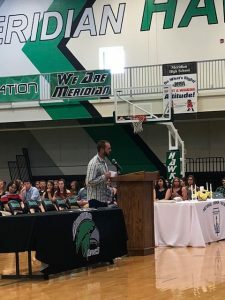 Blake presenting the 2018 Noland Family Agricultural Scholarship at Meridian High School. 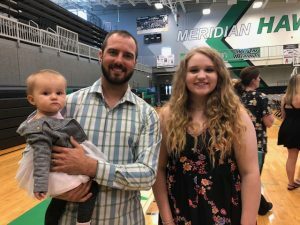 Blake, Lyla and Lauren at the Meridian High School Scholarship Banquet.